The Rok’n’Rol originated in 1942, by Allan Hershel Manufacturing Co. commonly known as ‘The Herschell Looper’. This design featured a rider activated pedal that could be pressed by the riders’ feet, engaging a clutch to flip the tub. 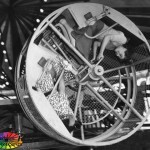 Still operating Herschell Loopers are rare but can be found in a select few USA parks. Chance continued to manufacture the ride between 1970-76 and increased the tub capacity from 2 to 4. Tub flipping was now controlled by the ride operator. With a capacity of 32 adults (4 per tub), Chance’s Rok’n’Roll is transportable on a single trailer and is commonly found at fairs and amusement parks worldwide. In March 2010 Chance Morgan premiered Unicoaster which combines several elements of their classic Rok’n’Roll with modern technology to thrill passengers. I checked out the video for the new Chance Down Force on Youtube http://www.youtube.com/watch?v=PCbd7WUXmYs It looks pretty awesome. Thanks for the info. 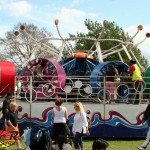 The most painful and boring ride I have ever ridden! I rode this ride last night in Lancaster, PA and it was amazing. It reminded me of the “Zipper” from when I was a kid, but was SO much better. We did flips the entire time and laughed so hard. Ive never seen this before,but it looks cool. Ah I remember riding this back when I was about six maybe. About 9 years ago at the Auckland Easter Show. Anyone know how much 1 of these goes for used? lol, 1 time riding it when i was a kid me & my cousin rolled it inverted & kept it there through the whole ride! 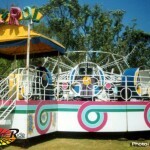 Belmont Park in San Diego, California traded their Chaos to Chance Rides for a Unicoaster a few months back. I’ve ridden the Unicoaster and I was disappointed with the ride’s experience as the rider-controlled flipping made the ride really predictable. I’d chose a Rok N Rol over a Unicoaster any time. 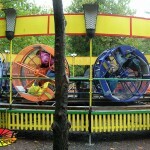 I rode a Unicoaster at Belmont Park – that ride is hot stuff! Outstanding ride, real sleeper ride for a one trailer piece. saw one of these in the county fair. the operater loves it when you want the spinning to stop and they just keep it going. it was alright though i think it wanted a little bit more out of it. The flipping of the tubs is not controlled by the ride operator. Just look at the center and you will see a track that the tires will run along to make the tubs flip. The tubs usually do not flip when the tire is not running along the track. I hope their are still some Chance Rides Rok N Rol ride models for amusement parks, and possibly for traveling carnivals as well,I would not mind riding one for the first time because I enjoy rides where the riders go upside down,if someday I were to see a Rok N Rol here in California I should be able to see the new Down Force ride model that,s suppose to look like the Rok N Rol.